- Use cautiously in patients using 5-alpha-reductase inhibitors. - Use cautiously in patients with hypertension or taking hypertensive agents. - Use cautiously in patients taking asthma medications, such as etirizine dihydrochloride and azelastine. - Use cautiously in patients taking cytochrome P450 metabolized agents. - Use cautiously in patients taking Helicobacter pylori agents. - Use cautiously in patients taking menopause agents or oral contraception. - Use cautiously in patients with parathyroid disorders. - Use cautiously in patients with osteoporosis. - Avoid in patients with known allergy to Astaxanthin or related carotenoids. - Avoid in patients with hormone-sensitive conditions. - Avoid in patients with immune disorders or using immunosuppressive therapies. - Avoid in patients who have experienced previous visual changes while taking Astaxanthin. - Avoid in patients with low eosinophil levels. - Avoid in patients who are pregnant or lactating. - Not recommended due to lack of sufficient data. - Astaxanthin may be unsafe in pregnant women, as it may affect reproductive hormones via 5-alpha-reductase inhibition. 5-alpha-reductase inhibitors: In vitro data suggests Astaxanthin may inhibit 5-alpha-reductase. Antihypertensive drugs: Based on an animal study, Astaxanthin may decrease blood pressure. Antilipemics: Preliminary in vitro and ex vivo evidence suggests Astaxanthin may inhibit LDL oxidation. Asthma medications: Based on an in vitro study, Astaxanthin may suppress T cell activation comparable to the antihistamines etirizine dihydrochloride and azelastine. 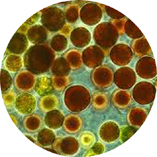 Cytochrome P450 metabolized drugs: Based on an animal study, Astaxanthin may induce CYP 3A4 and CYP2B6 enzymes. Helicobacter pylori medications: Based on in vitro studies, Astaxanthin may inhibit Helicobacter pylori growth. Immunomodulators: Based on in vitro study, Astaxanthin may enhance immunoglobulin (Ig) production in response to T-dependent stimuli. Menopause medications: Based on in vitro data that Astaxanthin may inhibit 5-alpha-reductase, dihydrotestosterone and testosterone levels may be decreased, and estradiol levels may possibly increase. Oral contraception: Based on in vitro data that Astaxanthin may inhibit 5-alpha-reductase, dihydrotestosterone and testosterone levels may be decreased, and estradiol levels may possibly increase. Parathyroid medications: Based on in vivo study, Astaxanthin may lower serum Calcium, which may suggest parathyroid intervention. Vioxx ® (Rofecoxib): Based on a preliminary study, Astaxanthin may decrease low density lipoprotein (LDL) oxidation caused by the Vioxx ®. 5-alpha-reductase inhibitor herbs (Saw Palmetto): Based on an in vitro study, the combination of Astaxanthin and Saw Palmetto leaf extract showed a 20% greater inhibition of 5-alpha-reductase than Saw Palmetto leaf extract alone. Calcium: Based on in vivo study, Astaxanthin may lower serum Calcium. Carotenoids (Beta-carotene, Lutein, Canthaxanthin, Lycopene): Concomitant use of Astaxanthin with other carotenoids (Beta-carotene, Lutein, Canthaxanthin, and Lycopene) may decrease the absorption of Astaxanthin, due to competitive absorption in the gastrointestinal tract. Cytochrome P450 metabolized herbs/supplements: Based on an animal study, Astaxanthin may induce CYP 3A4 and CYP2B6 enzymes. Helicobacter pylori herbs/supplements: Based on in vitro studies, Astaxanthin may possess inhibitory effects on Helicobacter pylori growth. Hypotensives: Based on an animal study, Astaxanthin may decrease blood pressure. Immunomodulating herbs/supplements: Based on in vitro study, Astaxanthin may enhance immunoglobulin (Ig) production in response to T-dependent stimuli. Menopause herbs/supplements: Based on in vitro data that Astaxanthin may inhibit 5-alpha-reductase, dihydrotestosterone and testosterone levels may be decreased, and estradiol levels may possibly increase. Parathyroid herbs/supplements: Based on in vivo study, Astaxanthin may lower serum Calcium, which may suggest parathyroid intervention.